Very happy with this ensemble. Colors are versatile, subtle and pretty. 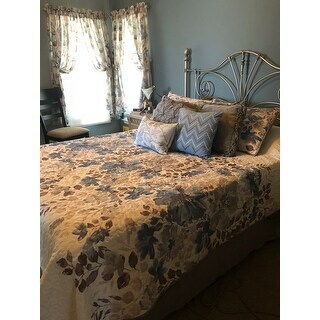 Create a calming oasis with the Madison Park Raven Coverlet Set.This beautiful collection features a watercolor floral print acrossthe center of the coverlet that dissipates to solid ivory on thetop and bottom. Three decorative pillows play up the soft blue topull this collection together. In the photo quilt looks light and airy. Ordered the blue. What arrived is not what I expected. Floral print is heavy and dark and old looking. I really like the look of this coverlet. I was a bit concerned about a spot where the stitching is missing. It's only about an inch of missed stitches, but I worry that it might get worse. Even so it's small enough that I don't really want to pack it up and return it for a replacement. Quardary. The spread is just the right weight, not too light and not too heavy. 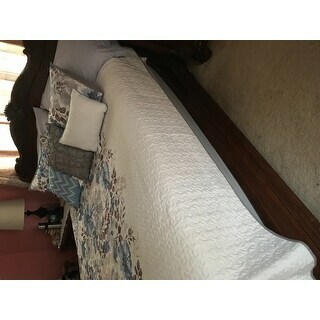 It looks nice on the bed and of course it comes with matching shams and 3 pillows! Great value. I wanted a summer weight quilt with "spring" look. This choice fits our décor very well. Our walls are light grey and there are touches of gray in this pattern. I already had 2 tan linen euro shams which complemented the set nicely. They king/Cal king size works well on our king bed - enough hanging over the sides to hide most of the sheet. Long enough to be able to fold some back at the top. I loved this quit set from the pictures. I purchased this in May but just opened the set. I am totally disappointed to find the print is not centered on the bedspread. See pictures below. 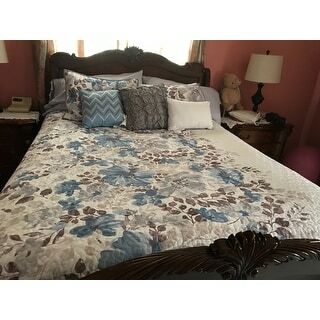 For the price I expected a quality quilt not seconds. The bedspread itself is very nice. Colors are good, weight is good. I am very happy with it. The three throw pillows that come with are definitely sub-standard. While removing the giant tags on the pillows the seams tore open on two of the three pillows. I am not looking forward to sewing them back up. This is a beautiful bed set. I love the colors and the fabric. 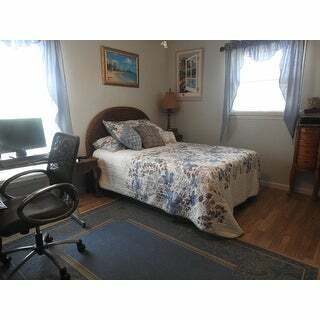 There are two pillow shams, and three throw pillows included. 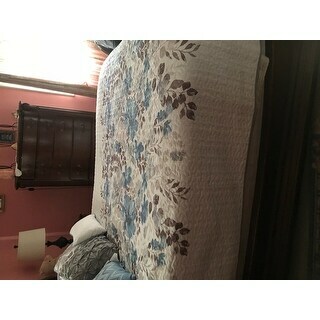 The coverlet is JUST big enough for the top and the sides of a queen sized mattress. If this wasn't for my platform bed, I would definitely need a skirt to hide the box spring. 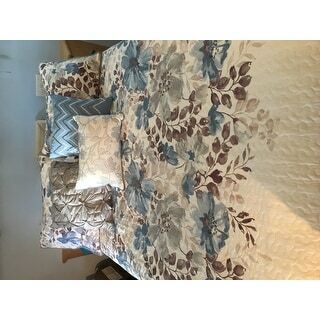 Nice coverlet, pillow shams are king size. More brown than grey's . I wanted to like this quilt because it is well made and attractive but the colors are wrong. All of the leaves are brown, not grey, not taupe but brown. My bedroom is done is grey and it just does not work. When I contacted them and said no where in the description does it mention brown and thought they had sent the wrong one, I was told nope the leaves are brown. So unless you want a lot of brown you will love it but if you want blues and greys stay away. I am returning it. 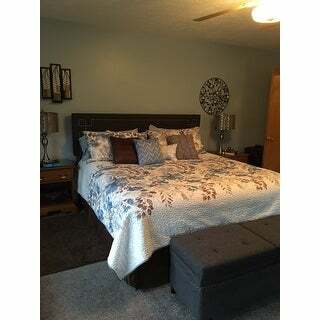 The quality style color plus fits my king size bed beautifully Love It!! it was really difficult to figure out how to put this spread on the bed. It s ok. I love this set. It matches perfectly with the drapes I've had for 4 years. I ordered on a Thursday and it arrived the following Saturday. Great quality and fast service. This set is beautiful. Well made. I have a queen size bed but I ordered a King. I wanted it to hang a little lower,. BEAUTIFUL You won't be disappointed. I bought this bed set for myself but haven't used it yet. Although it is colorful and bright, it has a hint of brown in the print. I didn't realize that from the picture. The wording said grey and blue. I hadn't planned on changing anything else in my room but, now I feel I should. The set is very nice and I would still recommend it to friends. Great colors! Very versatile. Good for all bedrooms! Pattern was considerably larger than depicted and not centered on quilt. I cannot believe the value for the money. I am extremely satisfied with this purchase. It makes the bedroom look so lovely. This set was as advertised. It matched beautifully with the colors in my room as well as brightening it up. "Do you carry the Madison Park Raven shower curtain to match it?" Unfortunately no, the matching shower curtain is not available. "does the set have a bedskirt"
No, but if you use on a full size bed it's not needed. I picked up an inexpensive white queen bed skirt. "does this quilt have a bedskirt"
No, this quilt does not have a matching bed skirt. "Does this quilt set have a bed skirt"
"Are there sheets to match this set?" "What are the dimensions of the Full/Queen size? I see the King/Cal King Size listed, but even when I choose the other size, the dimensions only list King. I'm wondering if it will be too short on a thicker mattress for a Queen bed." 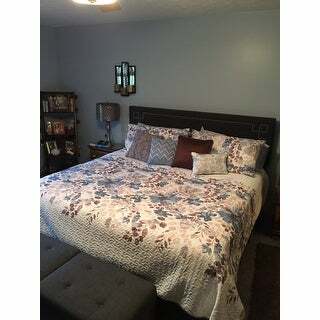 I am sorry I am not sure as I ordered this for a friend and she lives in Ohio not sure how it fits, but from my experience I have a queen bed with the over size mattress and the full/queen are to small so I always get the king.